There were two cows and they walked untethered across a great, overgrown green surrounding a well. Paul saw other houses in the distance but most were in disrepair, their thatch roofs gone or collapsed while the stone and wood walls crumbled. He saw no other life. The house itself was low and simple, with stonework walls and a thatched roof that was in bad need of repair. The stonework itself was still solid, though discolored with age and growth. A well was in the center of the yard, a product of more stonework. When he asked about it, the girl told him her father had been a stone mason. “Where is he now?” he asked. “Did he?” she asked without much emotion in her voice. “That is nice. Does he like his lake?” The question made Paul frown and look away. “His youngest son drowned in it, and now none may use it.” The girl nodded and that was all they spoke of it. She leaned him against the wall of the house, taking some care he did not lean against his bad arm and flipped open the latch. She toed open the door and she helped him inside. Paul didn’t know what he needed to do. He didn’t even know what he wanted to do. If went back they’d know him for a coward. If he disappeared they might have thought him killed or captured. Capture would mean his father would send more soldiers to get him back and war would erupt between the two Houses. Would my capture or death mean more to my father than coming home alive? She came back then with a broken spade. The metal head of the tool was gone, leaving only the wooden haft. He blinked and eyed her carefully. She helped him to stand again and slid the spade handle through an iron ring that was embedded into the wall. He realized he was standing between two of them and knew what she meant to do. He held out his right arm and she slid the handle through the sleeve and behind his back. Already he felt the weight of the armor come free of his right shoulder and he tried to raise his left but the pain was too great. “I can’t,” he grunted through clenched teeth. Tears welled into his eyes from the throbbing pain. She touched him lightly on his good shoulder and nodded. “It’s all right, here,” she said, slipping the handle through the neck of his mail and looped the other end through the second ring. “Try and bring your one arm out now,” she urged. Grunting, he crouched and pulled his head and right arm through the suspended sleeve of mail. The left clung to his injured shoulder and arm like wet cloth but soon he was half free. She guided him down to one knee and twisted the mail shirt until it slid up his injured arm. “Pull,” she whispered. “Only hurt for a moment.” The pain was blinding as he pulled his arm the rest of the way and collapsed on to his side, crying out as a thousand invisible knives stabbed his shoulder and arm. “There now,” she said and almost smiled as she knelt by him. The world began to grow dark on him as she touched his cheek and forehead. “Rest little lord,” she whispered. It was almost comforting but the edge in her tone made him uneasy. His last thought before passing out was unexpectedly of Jack and wondered if the young Kharl had picked up the sword he had thrown away. 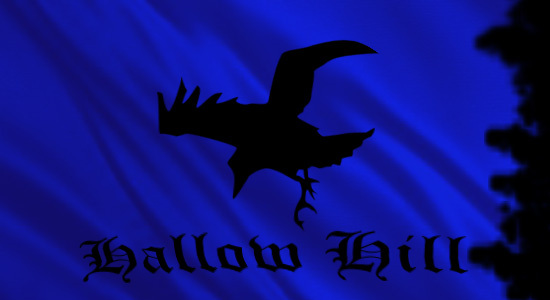 This entry was posted in Fantasy, Original Fiction and tagged Fantasy, Hallow Hill, Mike Kern, Online Fiction, The Aranor Saga. Bookmark the permalink.